Agile and Scrum - What is the Difference Between Agile and Scrum? With so much buzz about agile and scrum project management right now, you may be feeling bewildered about the difference between them, whether they could work for you, which one to choose, and how to get started. If you’re brand new to the ideas of Agile and Scrum, why not take a look at our “What is Agile Project Management?” and “What is Scrum Project Management?” articles? 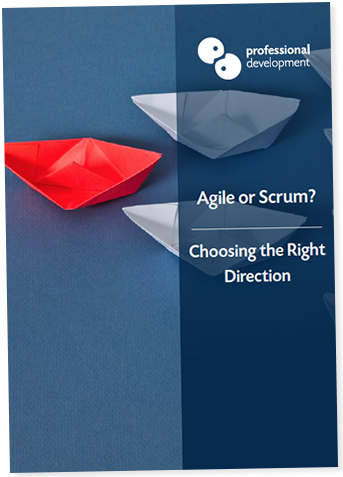 You can take an in-depth look at what the terms “agile” and “scrum” mean by clicking the buttons below. Are Agile and Scrum the same thing? Agile is an overall philosophy and methodology for managing projects. You’ll find several frameworks for implementation within the agile methodology, such as XP, kanban, FDD and Crystal. Scrum is the most popular framework for agile implementation, and you'll hear it mentioned almost as often as agile. You’ll cover an element of scrum project management on our Agile Certification Training Course, and a foundation in agile principles on our scrum courses. As scrum is so popular, and can be used independently of agile, there are many scrum focused workshops and certifications available. Can agile and scrum be used outside of the IT sector? The answer to this question is “yes”! Because of their origination in software development, and the high number of IT companies utilising both agile and scrum, it’s natural to wonder if using these methodologies in other industries will work. We run agile and scrum training programmes throughout the year, both for in-company clients and as public courses. Our clients and course attendees come from a broad range of backgrounds, such as pharmaceutical companies, manufacturing businesses, service providers, and government sectors. It’s also worth noting that agile and scrum are incredibly effective in organisations of all sizes, from small, local businesses up to multinational giants. How do I choose the right agile or scrum training and certification? This might be the most common question we hear, mostly because both agile and scrum training offer similar benefits, and deciding which is most relevant to your career can be a challenge. There are so many excellent approaches to managing projects and process improvement available right now. Choosing the right fit for your needs is like choosing a pair of shoes - there is no “one size fits all”. To begin with, think about what you want from your project management approach. How are projects run in your organisation? If projects are usually run by small, tightly knit project teams, and you are working within one of those teams, scrum training may be exactly what you need. If you are looking to change how projects are run across the business, agile could be a great place to start. Many of our clients to attend both our Agile Certification Training Course and Scrum Master Certified training. If you want an in-depth, fully rounded knowledge of Agile and Scrum, this is the route we recommend. Training will take 5 days in total (3 days for Agile and 2 days for Scrum), and these courses both lead to international certification. It’s perfect for anyone who wants to specialise in flexible, responsive project management. Our Scrum Master Certified (SMCTM) Course leads to an internationally recognised scrum master certification. It is suitable for all experience levels, with exam and certification costs included. We can provide a tailored Scrum or Agile solution for your business. For example, you may wish to train several scrum teams and have your leadership team become agile experts. This is a high-impact plan for businesses that would like to begin implementing an agile culture. You might like to start by dipping your toe in the agile pond, with an introduction to agile project management. Perhaps a focused, fully-trained scrum team is your priority. We offer a combination of Scrum Product Owner, Scrum Master, and Scrum Developer (team member) workshops. We can work with you to evaluate your exact requirements, and design a programme that works in harmony with your schedule and your strategic goals.